Founded in honor of America’s first scientist, Benjamin Franklin, The Franklin Institute is one of America’s oldest and premier centers of science education. The museum is known for blockbuster exhibits, a bevy of interactive ongoing exhibitions, and one-of-a-kind theatrical experiences. Located in Center City Philadelphia, The Franklin Institute is dedicated to public education and creating a passion for science by offering new and exciting access to science and technology in ways that would dazzle and delight its namesake. Discover something new at The Franklin Institute, where kids and parents can explore the fun side of science through twelve cutting-edge, hands-on exhibitions. Visitors can tour the human body, experience augmented reality, attempt to complete an escape room, gaze at the stars and sky at the Joel N. Bloom Observatory, and much more. 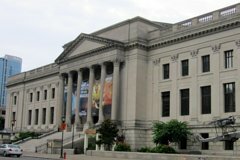 Every day The Franklin Institute provides resources that help people to connect with science and technology in creative ways that resonate with learners of all ages and backgrounds.